Juan Quintero’s stunning extra-time strike helped River Plate come from a goal down to record a historic victory over 10-man Boca Juniors in Madrid and win the Copa Libertadores. 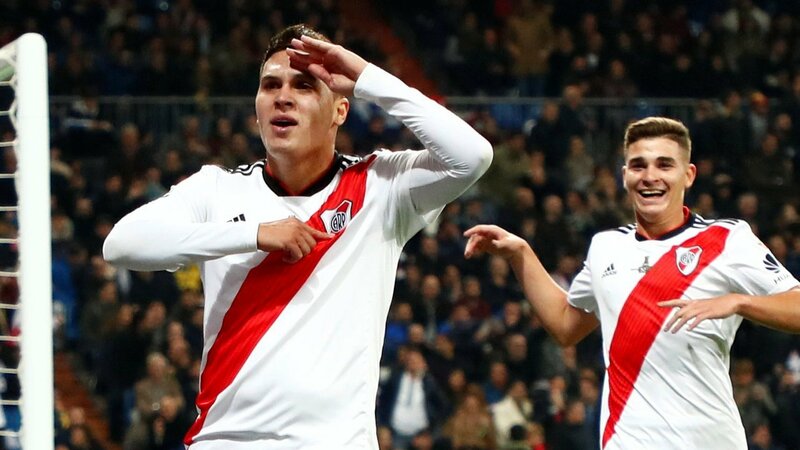 Quintero scored in the 109th minute of the second leg before team-mate Gonzalo Martinez confirmed a 3-1 victory on the night for River – and a 5-3 win on aggregate. Martinez ran the ball into an empty net with the last kick of the game after Boca keeper Esteban Andrada had been caught upfield at a corner. That ended a dramatic extra-time period, which had started with the sending off of Boca midfielder Wilmar Barrios for a second bookable offence – a two-footed challenge on Exequiel Palacios. Martinez’s goal completed a dramatic turnaround in a match moved more than 6,000 miles from Buenos Aires, in Argentina, to the Spanish capital after its postponement in November, when Boca’s team bus was attacked by River fans, causing injury to players and staff. Dario Benedetto had fired Boca into the lead shortly before half-time at Real Madrid’s Bernabeu Stadium. Benedetto finished off a devastating counter-attack and celebrated by sticking his tongue out at River defender Gonzalo Montiel. Former Barcelona striker Lucas Pratto equalised for River in the second half when he slotted home a cut-back at the end of a slick passing move. The atmosphere was raucous as the crowd spent the majority of the match standing up – and many River fans were seen crying with delight when their team equalised. Those supporters were delirious with joy as their team came back to win in the additional half-an-hour. It was the first time in the 58-year history of the Copa Libertadores that the two great Buenos Aires rivals have faced each other in the two-legged final, with the first leg, on 11 November, ending in a 2-2 draw. The build-up to this hugely anticipated fixture was full of controversy after the second leg – originally scheduled for 24 November – was postponed as a result of the bus attack. Boca players suffered cuts from broken windows when their team bus was attacked by River fans and were also affected by the tear gas used by police to disperse the crowds. A number of players, including Boca’s Carlos Tevez – the former Manchester City, Manchester United and Juventus striker – reportedly suffered from dizziness and vomiting. Boca argued River should have been disqualified from the competition, but a late attempt to postpone Sunday’s rescheduled second leg match was rejected by the Court of Arbitration for Sport (Cas). The Copa Libertadores is the showpiece club competition in South America, equivalent to the Champions League in Europe, and there were several household names in attendance at the Bernabeu, including Barcelona’s Lionel Messi and Juventus’ Pablo Dybala. Why was it played in Madrid? The two Buenos Aires sides met in front of 72,000 fans at the Bernabeu, where the match was moved in an attempt to avoid further crowd disturbance. However, the decision to move the final of South America’s biggest football competition to another continent was hugely criticised, with a number of fans unable to travel because of the cost of the trip. River Plate and Boca Juniors were each given 5,000 tickets, but only 4,000 fans from each club flew to Spain. Another 20,000 tickets, which were first available to Real Madrid members, sold out within hours. Inside the Bernabeu, a vacant block of seats acted as a buffer between the two sets of supporters. The road outside was closed for the entire day and around 2,500 police officers were on duty. Tevez was among those who challenged the decision and he told BBC’s World Service it was “embarrassing for the people”. “They took away our dream of playing the final in our country,” said Tevez. The head of South American football, Alejandro Dominguez, told the BBC that Madrid was the only city where it was realistic to host the postponed second leg. “Madrid is an exceptional decision in exceptional circumstances,” he said. “We found out that there is a big population of Argentineans living in Spain. In fact, it’s the biggest outside Argentina. There are 350,000 Argentinean people living in Spain so we wanted to give the opportunity to them to live this match and feel it. The build-up to the match may not have centred on the football – but the final produced one of the most exciting games of the season. Both teams attacked with intensity and aggression and the drama played out until the very end. River battled to come from behind and ensure it went to extra-time, and then Barrios’ sending off changed the dynamic of the game. Boca were forced to change tack but they still attacked, leaving spaces at the back for River to exploit in an end-to-end and tense half-an-hour. Quintero’s goal lit up the show but Boca almost equalised at the finish when Leonardo Jara’s thunderous volley smacked the outside of the post. Boca keeper Andrada then left his goal free as he challenged for the ball at a corner before Martinez raced away to score River’s third with the last kick of the game. River’s players fell to the ground at full-time in disbelief.